The idea was Alfred Stieglitz’s. Although Steiglitz suffered from logorrhea—compulsive soliloquizing, in his case—he gave the concept he derived from Symbolist art an elegant, simple name: an equivalent. In 1922, he claimed that his photographs were “equivalents” of his philosophy of life, and he famously titled a series of cloud photographs Equivalents, firmly setting the idea into the vocabulary of photography. 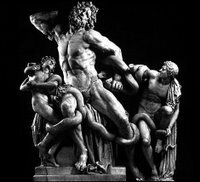 The term is simply the observation (or the assertion) that a picture of some specific thing can evoke other things altogether, in terms of feeling, meaning, associations, or form. Stieglitz’s cloud pictures don’t measure up to their rap for yr. hmbl. critic. That is, they never much looked like anything but clouds to me, and many photographers—I think of Ralph Steiner first—have done better cloud pictures. But the idea of equivalence became a linchpin of expressive photography’s struggle against the medium’s insistent literalness and its often frustrating specificity. In the past I’ve described Weston in Ezra Pound’s innovator-to-master progression (from The ABC of Reading, I think) as being most important neither for what he made of those who came before him nor how he influenced those who came after, but as a “great monolith” towering apart and unique in the adventure of photography’s early unfolding—important merely, and most impressively, in and of himself. He could see form in void, universality in specificity, arrangement in chaos, abstraction in hard reality, rarity in the common, beauty in decrepitude, and organic form everywhere, before anyone had shown us the way. But whether he’s photographing deserts or kelp or women’s bodies or random debris, I understand him at the most basic level as a still-life photographer. His sensitivity to form and arrangement was supreme, and it resonates for us in a great many of his pictures—even when we’re not so aware of it as we are with this one. In that sense it’s really not so much of a surprise after all that we so plainly see writhing in his quiet, still pepper, whether it evokes for us a struggle (cf. 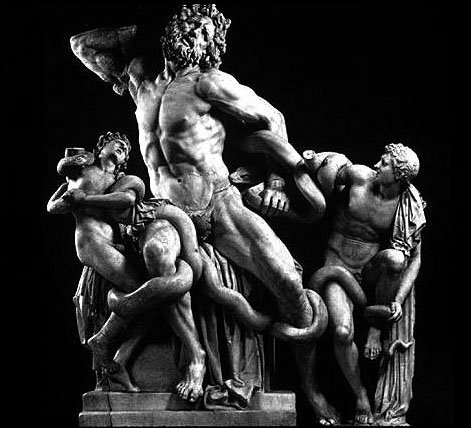 the Laocoön, right) or the grapple of lovers (cf. 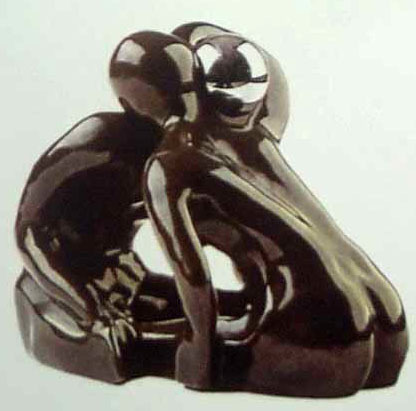 Monika Vasquez, The Embrace, bronze, above left). It is form that the still-life photographer brought to life, and that we respond to. It might even evoke things further into the reaches of the unconscious that are just as powerful…and just as far removed from a lone, somewhat deformed vegetable. Because that’s one thing, at least, that this picture has never been about. Legend has it that after photographing it, Edward and his sons unceremoniously ate this most famous of all green bell peppers, in a salad. * Every Tuesday, Your Humble Critic cranks his way up toward the Indisputable Number One. I checked Daybook II for more information on this pepper's Finest Hour. It seems to have spent more like a week under the lights, and was apparently a bit the worse for wear at the end. There is some confusion. At one point the "favorite negative" is described as shot on Saturday, but then in another entry the tin funnel idea is said to have occurred on Sunday. I hope times were flush enough then that another pepper could have been selected for Sunday's salad. Incidentally, the 1960's edition of the Daybooks, from George Eastman House, prints the pepper much lighter than your jpeg appears to me. Are there variants? A great choice. Weston was one of my earliest influences in photography, and still one of my favorites. The pepper certainly does transcend reality, becoming much more . Seems like it also became part of Weston. Okay, Mike, so far so good. One slip and we gong you! 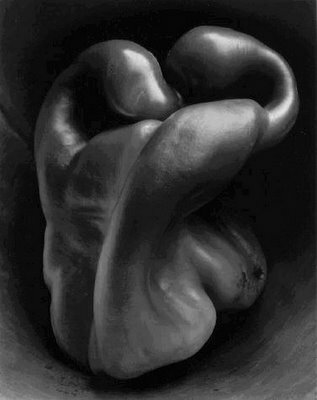 "Although Steiglitz suffered from logorrhea—compulsive soliloquizing, in his case..."
There is a really nice reproduction of Pepper no 30 in Lodima Press Edward Weston Life Work. I think #9 will be much more controversial, for several reasons. Stay tuned. I've seen this picture before and it didn't seem that compelling compared to his other work. Looking at it again I'm beginning to appreciate this shot more and more. Weston's pepper looks to me like an embryo Arnold Schwarzenegger struggling to attain human form. He's still working at it, I believe.